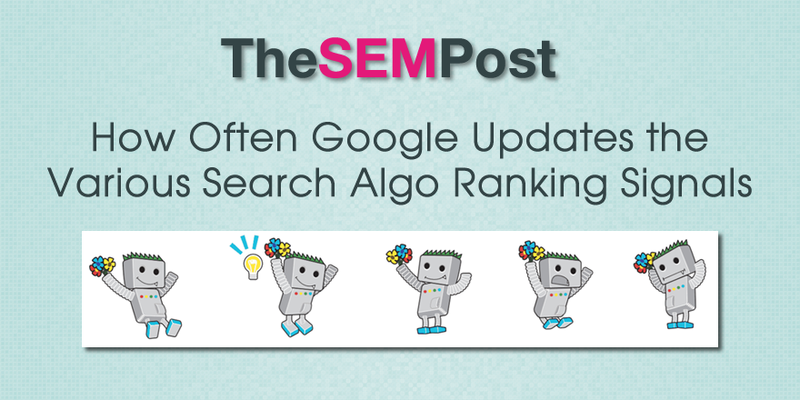 Do Google’s various ranking signals within the search algo get applied all at the same time, or can the various parts get updated in cycles with how it ranks a site? We do know that some – like Google Panda – work on a long running cycle. But what about the remaining 200 or so signals? The question came up in today’s Webmaster Office Hours. How long does it take for all 200 ranking signals in the aglo’s to be refreshed so for instance, can I safley say that my website now , would be based on algo ranking scores from between x time ago and today? I am guessing that some algo’s scores feed into others and so on, is that how it works ? John Mueller responded that many are on their own update cycles. So there isn’t a specific date monthly (or weekly, or yearly) where everything is refreshed all at once. We don’t actually have any specific time frame for everything being updated. These are to a big extent, these are things that are all running in parallel and all running in kind of different cycles. So some of these update very quickly, some of these take a little bit longer to be updated. So it’s not something where there’s a simple monthly basis where we would say everything is updated at the first of the month, it really depends a lot. And it also depends a bit on the website itself, how often we crawl individual pages from that website, in the sense that some pages on every website are crawled very frequently, sometimes every couple of minutes even, we use those to kind of update things that we think are fast changing. And a lot of pages on most websites are crawled very infrequently, that might be several months in between, or maybe even up to a year. So when you look at something like that for a website, even just from crawling the content, it can take anywhere from several minutes to couple of months for that to even be updated on our side. And the various algorithms that we have, they do try to be fast and responding to what’s out there on the web, but some of them are fast, some of them are a bit slower, and some of them like to take into account more of the history of what has been changing there. So there’s no easy time or easy answer to you in regards to when will everything kind of take into account what my current status is now. This is kind of good news for webmasters. If Google decided to update all 200+ ranking signals at once, it would be very difficult for SEOs to try and reverse engineer about any fluctuations that seem to be related to a quality update in the search results. Of course, we don’t know which are on a longer rollout cycle, other than Panda. But this does give some more insight into how Google updates the search algos on their end, and how they work in cycles.